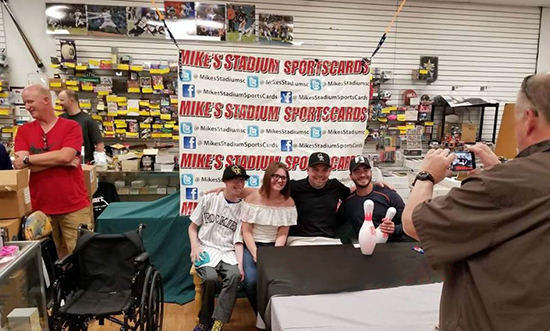 For years Upper Deck’s Heroic Inspirations program has shined a light on brave youngsters involved in sports by creating a special card of them and helping to raise some funds for causes they may be involved with. It’s commonplace for fans to want to collect cards of million dollar players who do amazing things on the field, but Upper Deck would like to invite fans to collect inspiration from athletes who deserve the spotlight just as much as their professional counterparts. Such is the case with Trevor Kling who Upper Deck first heard about from his card shop owner, Mike Fruitman. 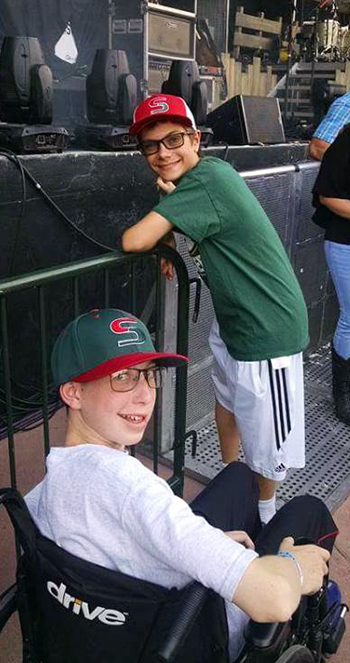 Trevor and Mike Fruitman’s son Samuel enjoyed rocking out in the pit for the Dierks Bentley show recently in Colorado. Trevor and his family enjoy at athlete signing session at Mike’s Stadium Sportscards courtesy of Mike Fruitman. Trevor is an accomplished baseball player and a pretty incredible bowler as well. 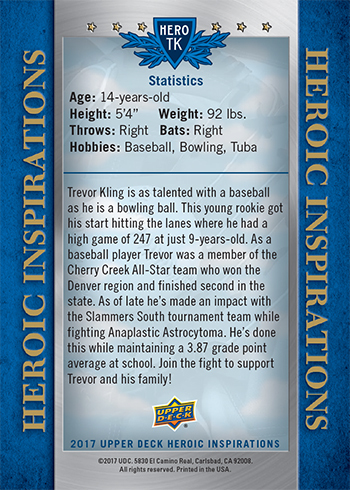 Since people are less familiar with bowling cards however, Upper Deck opted to create a baseball card for Trevor to pay tribute to the adversity he has worked through. Trevor is an incredible role model for kids, especially those going through difficult times. 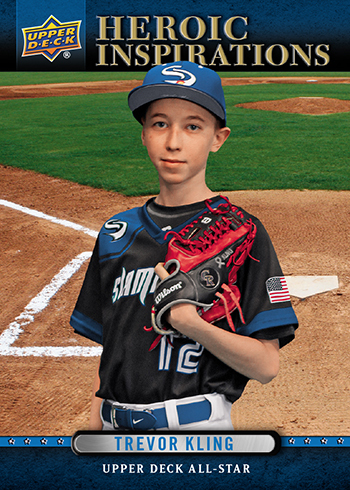 While fighting Anaplastic Astrocytoma, Trevor managed to continue playing sports while maintaining a 3.87 grade point average at school. Collectors interested in scoring Trevor’s cards simply need to reach out to Mike’s Stadium Sportscards who will be distributing the cards for free with a donation to help Trevor’s family with the medical expenses that have been racking up. Upper Deck invites you to collect inspiration when Trevor Kling’s cards hit Mike’s Stadium Sportscards in early October. The back of Trevor’s cards provides a lot of details about the way he battles adversity while dealing with this insidious disease. Upper Deck would like to wish all the best to Trevor and his family while thanking Mike Fruitman for bringing his story to us. Thanks in advance to all the collectors who support this great cause!